Originally aired on December 11, 1973, The Cat Creature is a purring color tribute to the moody Val Lewton films of the 1940s, and an extremely entertaining Made-for-Television movie directed by genre regular Curtis Harrington. Russian born producer Lewton had been responsible for a number of effective low-budget thrillers for the RKO studio. 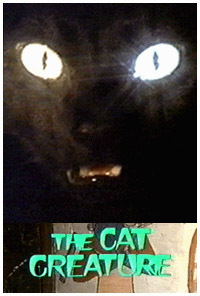 The Cat Creature was an effective homage to his best-known work, 1942's Cat People, and concerned a reincarnated Egyptian priestess who kills in order to stay alive in modern day Los Angeles. Along with newcomer Meredith Baxter, the ABC-TV film featured a few faces familiar to genre and 'B' picture fans, including John Carradine and Gale Sondergaard (in her first film since being blacklisted two decades earlier), as well as Kent Smith - one of the leads in the original Cat People. Late one evening...Frank Lucas (Kent Smith), a licensed appraiser, goes to the home of a client who has passed away to finish taking inventory on a collection of ancient artifacts that the man has left behind. For some reason, the power has been turned off and Frank has to use a flashlight to see. The place gives him the shivers but he gets to work right away, tape recording his words. Dr. Hiram Drake, the deceased, was a man whom Frank says was given to "secret panels and hidden staircases." Having completed the inventory on the first and second floors, Frank is set to tackle Dr. Drake's secret collection...which apparently the doctor had spent a great deal of money on. Down into the basement the appraiser goes...past crates and assorted Egyptian pieces. At the end of the room stands a magnificent sarcophagus and after prying it open, he finds a mummy with an amulet around its neck. There is an engraving of a cat with emerald eyes and the piece is solid gold. On the back are some hieroglyphics. Momentarily leaving the cellar to get his recorder, Frank is unaware that he is not alone. An Oriental thief named Joe Sung (Keye Luke) is there to steal the amulet. Sung sneaks out upon Frank's return and Frank starts to record again. He describes the sarcophagus and the amulet, noting that Dr. Drake died shortly after having received the acquisition and that the man's attorney probably has not even seen it. And then something strange happens. The lid opens and the mummy is gone. Frank hears the sound of a cat and is attacked and killed by a feline creature. Joe Sung takes the amulet to The Sorcerer's Shop, a store specializing in the occult owned by Hester Black (Gale Sondergaard). The proprietor is at first curious about what he has to offer and asks where it came from. It's a "family heirloom" left by his dead grandmother, he tells her. Hester is not interested and kicks Sung out. Sung leaves his empty briefcase behind and outside the shop, a cat lurks near the entrance. It's the end of the workday and an employee named Sherry Hastings (Renee Jarrett) is ready to go home. Hester pays her for the week and also gives her the briefcase as a gift. Sherry doesn't enjoy working for Hester...she finds her too possessive. But she is saving her dough so she can leave the job in a few weeks. While walking home to her apartment, Sherry comes across a black cat, which she takes home to feed. The cat is drawn to the briefcase. There must be something inside that it wants. And then Sherry is taken aback when she notices blood on the cat's paw. Suddenly, she looks into the creature's eyes and becomes entranced. Following an order, she goes to her balcony and jumps to her death. Hester, now in need of a new sales clerk, hires Rena Carter (Meredith Baxter)...a young woman who comes in to inquire about the help wanted sign. The police arrive at the estate of Dr. Drake after the body of Frank Lucas is discovered there. Police Lt. Marco (Stuart Whitman) calls for Professor Roger Edmonds (David Hedison), who specializes in archeology...to help identify the missing pieces. The professor has a keen interest in Egyptology. Lt. Marco takes Edmonds down into the cellar and tells him it looks as if someone didn't want the mummy identified. Although a chisel was found nearby (which is being sent to a lab for fingerprints), there appear to be parallel scratches and claw marks on the outside of the sarcophagus. Wounds were found on Frank's throat and face leading the professor to wonder if an animal could have inflicted them. Lt. Marco tells him that an autopsy will reveal the exact cause of death. On the face of it, the robbery appears to have been the work of a common thief. In addition to the amulet, silverware was taken from the upstairs quarters. The missing mummy, the lieutenant reasons, could simply have disintegrated when exposed to the air. And yet there is no evidence of that...dust is nowhere to be found. The corner's initial report is given to Lt. Marcos. The wounds found on Frank were made by teeth and claws...and cat hairs were found on the body. The two men go in search of pawnshops around the city, hoping to find the stolen artifacts. Their last stop is The Sorcerer's Shop, where Hester confirms that a man tried to sell her the amulet in question. He was Oriental...probably Chinese, she tells them. She describes the piece perfectly. The only other person in the store at the time was Sherry Hastings, whose name Lt. Marcos recognizes from a police report about her apparent suicide. Rena is alarmed at the news that her predecessor is dead and drops a statue she's holding, breaking it. She wonders if the amulet could have some kind of curse on it. "It's only a piece of jewelry," Hester tells her. And besides, Sherry never even saw it. Her boss assures Rena that the amulet is not in the store. Prof. Edmonds is waiting for Rena outside the shop. She seemed so startled about what she heard that he invites her out to dinner. During the meal, the professor entertains Rena with his ancient Egyptian stories. Rena, meanwhile, remains mysterious about her past. All Edmonds knows is that she's "from the East and new in town." When they leave the restaurant, the two walk past a pet store and Rena is shaken by a group of cats in the window. She claims she doesn't know why she's terrified by the display but it is certainly an odd reaction. The next day, Lt. Marcos makes a return visit to Hester's shop with a couple of mug shots. Hester identifies the photo of Joe Sung, whom Marcos describes as a "part-time handyman, full-time wino" who had been hired as a gardener for the Drake estate. There's only one location to find someone like that. Lt. Marcos pays a visit to a flophouse - where the hotel clerk (John Carradine) recognizes the picture and tells the officer that Sung checked in the night before. It's a seedy environment and just the sort of place where a petty criminal would hide out. Sitting on the clerk's desk is Mabel, a sassy dwarf with a fondness for booze...who also saw the Chinese man. The shadow of a cat walks silently through the establishment...when suddenly, a loud scream is heard coming from one of the rooms. Lt. Marcos rushes to find the source of the screeching while a sickly growl can be heard up and down the hallway. After kicking down Joe Sung's door, the officer sees the man's body strewn on the bed, his neck marred by bloody scratches...and his face contorted in an almost grotesque grin. Professor Edmonds returns to The Sorcerer's Shop, certain that this latest death connected to the amulet will upset Rena. But she isn't there. Instead, Hester reads his tarot cards and turns up the final card of "death." That is to be his fate, she tells him, for getting involved. The professor then stops by Rena's home, a beautiful house she's renting from the owners while they're away. There, he gets a phone call from Lt. Marcos at Hester's shop. The pawn ticket for the amulet was found in one of Sung's shoes. He had sold it for much less than it was worth. As Hester eavesdrops on the conversation, Lt. Marcos tells Prof. Edmonds that the Drake collection was smuggled out of Egypt illegally and the Egyptian government is considering a $50,000 reward for its return. The professor could receive a share of the money by helping in the case. Both men pay a visit to the Deputy Coroner (Milton Parsons), who informs them that the marks on Frank Lucas and Joe Sung were identical and caused by an average domestic cat. What's more, their bodies were nearly completely drained of blood. Next stop: the pawn shop Sung had been to...where instead of the amulet, they find the pawnbroker (Peter Lorre, Jr.) with a knife in his back. A black cat is nearby. The logical suspect is Hester, who has disappeared. If she indeed stole the amulet and killed for it, the murders were all for naught. The State Department has asked the Egyptian government to withdraw the reward, fearing it could encourage thefts of other priceless artifacts. Rena's help is enlisted to apprehend her boss. She is asked to keep the store open late in the hope that Hester will return to retrieve some cash she keeps there. There is a guard posted outside but he falls asleep and is sidelined when the black cat appears. Sure enough, Hester shows up and is attacked by the cat. Her shrieking gets the attention of both Rena and the guard and they rush to her aid. But it's too late. "What happened?" asks Rena. The only word Hester utters is "cat!" before she dies. The amulet is found sewn into the lining of her cape. Prof. Edmonds identifies it as being from around 450 BC - the period when the temples of Bast were destroyed. Lt. Marcos allows Edmonds to take the amulet to his university to decipher the writing on the back of it. Dr. Reinhart (John Abbott) has his own thoughts about the origin of the piece and what it means. He theorizes that because of the heavy chain attached to it, the amulet must have been put around the mummy's neck to keep it prisoner and to prevent it from coming back to life. A direct translation of the hieroglyphic proves him right. Part of it says, "For he who dares to remove it will open the gates of hell." The mummy had been revived when the amulet was stolen and the cat creature is really the mummy of the high priestess of Bast. Prof. Edmonds gets further disturbing news from Lt. Marcos. A background check has revealed that there is no trace of Rena anywhere and she is now the prime suspect in the killings. The professor heads over to Rena's home, which is being prowled by numerous cats from the neighborhood. He confronts her with his belief that she is, in fact, the high priestess and she has been searching for the amulet to destroy it in order to attain immortality. Rena admits the truth but calls what she has done "self preservation, not murder." She asks Prof. Edmonds to join with her and promises him eternal life. But when he refuses, she turns into the cat and attacks him. Thinking fast, Edmonds puts the amulet around the creature's neck. Rena suddenly reveals herself as the high priestess and howls in the agony of defeat. Then she opens the doors to the patio and turns back into the mummy. After being pounced upon by the other cats...only dust and the partial remains of her skeleton are left when the police arrive. Who better to direct The Cat Creature with its homage to the past than Curtis Harrington? A fine old school director if there ever was one, Harrington clearly understood his source and had respect for the Val Lewton movies of the '40s. There's a reason why The Terror Trap thinks of Harrington as the "George Cukor of horror." Like Cukor, Harrington was a master at directing classic female stars. Among the beneficiaries of his craft: Shelley Winters and Debbie Reynolds in What's the Matter With Helen? ; Winters again in Who Slew Auntie Roo? ; Ann Sothern in The Killing Kind; Gloria Swanson in Killer Bees; Piper Laurie in Ruby; and Simone Signoret in Games. There were men too. Anthony Perkins in How Awful About Allan and Ray Milland in The Dead Don't Die, for example. But it's the women that Harrington seemed particularly comfortable with. And in The Cat Creature, he gave the once blacklisted Gale Sondergaard the chance to shine again...in a role reminiscent of the mysterious Eurasians she played during her heyday. A young Meredith Baxter is equally good, fresh from her part in Ben the previous year. Good score by Leonard Rosenman, wonderful direction by the aforementioned Harrington...Cat is a hard to find film that is worth seeking out.